Nativity sets can be a fun way to help children learn, remember and understand the beginning of the story of the Best Gift Ever; Jesus' birth! So, today for our week of Christmas crafts, I'm sharing two more simple, and fun, ideas for how children can make their own nativity sets. Sets which will hold up to little hands handling them year after year and which can help children and families start a Christmas tradition of their own, as they set them out each year! I found both sets on Pinterest, so if you follow the links, you'll find all the supplies and directions you need to make a salt dough nativity set or a wood block nativity set. If you decide to make the salt dough nativity set, it will take a couple weeks to complete as the first week children can form their pieces and then you can bake them, so the following week they can paint their sets - or color with permanent ink pens. If you do this, be sure to have children mark their pieces so you will know how to get the correct baked pieces to the child who made them. And remember, it is okay to have children make just the main parts of their set - send the salt dough recipe home with them so families could work together to make additional sheep, shepherds, wise men, angels, etc. to add to their set. 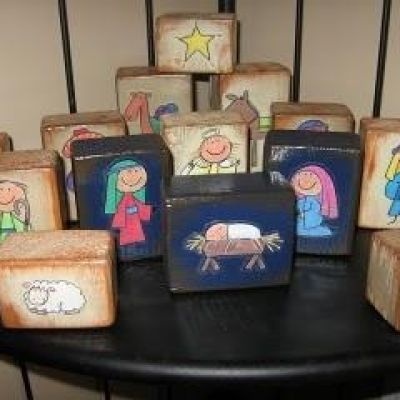 If you make the wood block nativity set, again, you could have the children make just the main parts and then if families want to add to their set, they may do so. I like using permanent ink pens instead of paint since they do not have to take time to dry. I also like these as you can allow children to draw their own Mary, Joseph, baby Jesus, etc. or give them stickers or printed figures to add to their blocks. Whichever set you decide to use, be sure to talk with the children about who each person in their set represents and what they did when Jesus was born. Talk with the children about how just as Mary, Joseph and the shepherds all chose to obey and the wise men chose to seek Jesus, they can make the same choices today!